Brighton resident David Schrag heard Jay Severin on the radio the other day saying (yet another) idiotic, if not downright offensive, comment: "Poor people are boring and often smell." Some listeners enjoy this kind of talk radio; others might laugh it off. Personally, I never listen to mean, nasty, and brutish acts such as Severin or Howie Carr. But Schrag called him on the remarks -- literally. Jay: I’ll let you define the poor. David: No, no. You’re all about "words have meaning." You know, you’re very precise in terms of language. David: And so if you’re going to use a word like poor, I assume you know what it means. It’s a relative term, so what does it mean to you? Jay: "The poor" is not a relative term. The poor are the poor. Schrag was unsuccessful at getting Severin to define the term "poor", probably because Severin realized it would have caused many of his listeners to realize suddenly that Severin was insulting them directly. Ah, the dangers of engaging in class warfare when your livelihood is at stake! Severin eventually hung up on Schrag. Not leaving it there, Severin launched into a six-minute tirade against the caller who could no longer defend himself, calling Schrag "some poor, friendless, unemployed... wanking dwarf... I think he probably smells." Needless to say, Schrag is not unemployed. He's a local business owner and a member of the Brighton Board of Trade who does not frequent dungeons. Severin's show probably won't be getting much in the way of Brighton advertising dollars anytime soon. But at least Severin managed to hold onto his impoverished listeners. Back in December, the roof of the Rite-Aid Pharmacy on Market Street in Brighton Center collapsed due to heavy snow. The walls of the building, particularly the southern one, were in danger of further collapse, so exterior scaffolding was installed outside the eastern wall; the southern perimeter was also fenced off. The theory was that, if the southern wall collapsed inwards, the eastern wall could potentially buckle outwards towards the sidewalk on Market Street. I've seen the southern wall buckle more and more over the last few weeks; it has now partially collapsed, exposing some of the insulation. While I'm not an engineer, it nonetheless appears as though there is little danger of the eastern wall falling outwards: the scaffolding appears to be working as intended. By not bringing in a wrecking crew to demolish the building, the owners have probably saved five minutes of demolition charges by letting gravity (and additional snowfall) take its toll on the building. I think it's high time for them to move on and clean up this mess. I say: "Mr. Rite Aid, tear down this wall!" In an unannounced appearance at the conclusion of the Allston Brighton Green Gathering, Councilor Michael Ross of Mission Hill delivered the news that the BRA Board voted earlier in the day in favor of limiting apartment occupancy in Boston to four or fewer students. Councilor Ross submitted the petition to change the definition of a "family" under the city's Zoning Code that would exclude groups of "five or more students enrolled at or attending a post-secondary educational institution" from being able to live together in a single housing unit. The city's previous definition of "family" was overruled by a 2003 court decision and subsequent consent decree, which meant that landlords could rent to larger groups of students during the past five years than previously allowed. The Boston City Council has already unanimously approved Councilor Ross's petition. The next and final step for approval will be an appearance before the city's Zoning Board on March 12th. Councilor Ross said that opponents to his proposal -- I'm guessing that these include the Small Property Owners of America -- have put out the call to appear in large numbers at the upcoming Zoning Board meeting. The most surprising detail was that many of the city's institutions of higher education have come out in favor of his proposal. After the event, Councilor Ross stated Northeastern University, Wentworth Institute of Technology, Massachusetts College of Art, Massachusetts College of Pharmacy, the School of the Museum of Fine Arts, and Suffolk University were all backing his proposal. He also noted that several other prominent institutions were considering supporting the proposal, including Simmons College, Boston University, and Boston College. Councilor Ross also noted that the Greater Boston Legal Services, who had brought the court challenge to the previous definition of a "family" under the Zoning Code, were now supporting Ross's petition. Many other cities and towns regulate the number of occupants a housing unit may have. At the Green Gathering, Councilor Ross noted that Newton had similar problems with over-crowded, off-campus student housing and pass an ordinance much like Ross's proposal. The Newton ordinance, he said, was successfully defended in court. Ross said some neighborhoods, including Brighton, have an overabundance of students. Students will move to areas with more space for them as a result of the proposal. Enforcement of the law would be complaint-driven; for example, if a neighbor reports a lot of occupants in a house with nightly parties to the Inspectional Services Department. Ross said 99 percent of the people who support the proposal are from the community, whereas 99 percent of those who oppose it work in real estate. The ACA supports it. A-B City Councilor Mark Ciommo said, “A-B is unique because we have so many students living off-campus, and I believe this amendment would help reduce problems with overcrowding and quality of life in these neighborhoods.” He also said it would alleviate problems associated with absentee landlords. The meeting of the Zoning Board will be on March 12, 2008, at 9:00 am, in Room 900 on the 9th Floor of Boston's City Hall. Jack Dunn, Director of Public Affairs at Boston College, was quoted last week in the Boston Globe alleging that neighborhood opposition to two proposed dormitories amounts to "NIMBYism." This week, Dunn lobbed another grenade by calling Brighton residents opposing those two proposed dorms "ardent obstructionists" in the BC student newspaper, The Heights. The Boston Redevelopment Authority last week released its Scoping Determination on BC's proposed master plan requesting a series of alternatives and studies of various elements, particularly undergraduate housing. The document called for BC to increase its undergraduate housing on its main campus, but not to build dormitories on the former St. John's Seminary land purchased by BC in 2004-7. I noted the inaccuracy -- if not silliness -- of Dunn's earlier statement because it would seem to imply that Mayor Thomas Menino of Hyde Park, who also expressed opposition to the proposal, somehow had a backyard abutting the former seminary land in Brighton. Harry Mattison said that Dunn's statement meant that BC was "No more Mr. Nice Guy." "Given the density of our Chestnut Hill Campus, if we could not build 500 beds in the 65 acres of our Brighton Campus, it would mean that an additional 500 students would remain in the neighborhood, which would be to the benefit of no one except the most ardent obstructionists," Dunn said. Needless to say -- or as Barack Obama might have retorted -- Dunn's remarks show little connection with reality. While the version of the Scoping Determination that includes public comments has not yet been released, my estimates are that 400 (or more) Brighton residents will be on record with the BRA expressing their opposition to the "Brighton Dorms" on the former seminary land. Sure, some are abutters to the former seminary land, but many live far further away from the proposed dorms -- half a mile or a mile away, like me or residents of the Oak Square area. Abutters are likely a tiny minority of the opposition, so "NIMBYism" rings hollow as the fundamental explanation for the opposition. Instead of opposing the plan because it's in their backyard, residents across Brighton oppose it because it's a lousy idea. The proposal would: put undergraduate student dormitories in one of the last urban wilds of Brighton (how ironic! ); put student housing, a "forbidden" use under Article 51 of the zoning code, in a property with underlying zoning of "Conservation Protection Subdistrict"; and put 500 undergraduate students on land bordered by one of the last stable, family-friendly neighborhoods in Brighton. The "Brighton Dorm" proposal is a dumb idea, and you don't have to live next door to it to realize that. Dunn's latest "obstructionist" insult appears to be a deliberate misrepresentation of reality: those same public comments will likely show that well over 100 Brighton residents, regularly involved in this process, are on record with the BRA as offering an alternative proposal to house all the rest of BC's students on their main campus -- with plenty of room to spare. Mayor Menino seems to have come to a similar conclusion when he told the Globe, "I say to them, why can't they build the new dorms on the campus they already have? We want to see more housing on the present campus." Here's how you do it: don't raze 790-bed Edmonds Hall (or replace it on-site); turn two-story Mods into six-story dormitories; add in a dash of the More Hall site (aka "Moore Hall" at The Heights), the Rec Plex site, the far corner of Shea Field, and/or the upper campus; and... voila! 100% on-campus housing and no need for a BC official to be lobbing language like that towards Brighton residents. The neighborhood's alternative proposal is not obstructionism, it's called "offering solutions." Any other characterization is a mis-characterization. What might be the next vicious verbal volley to come towards Brighton from BC? Will the neighbors be called "nattering nabobs of negativism"? If Brighton were to succumb, execute an about-face, and march in lockstep behind the proposed master plan, would they then be exhibiting "avid obsequiousness" instead of "ardent obstruction[ism]"? The Allston Brighton Green Space Advocates, a group sponsored by the Allston Brighton Community Development Corporation, is hosting their annual "Green Gathering" on Tuesday night for neighborhood groups devoted to green spaces and other interested area residents. The event is open to the public. This is a slightly crunchy affair that provides an oversight into ongoing activities related to open spaces in Allston-Brighton: the green streets initiative; work on obtaining conservation easements; connections with the city's 100,000 tree initiative; and networking with other neighborhood groups working on open space issues. Neighborhood groups are encouraged to bring literature along about their group for tabling at the event. of that open space is owned privately. For example, according to the Boston Parks and Recreation department, 58% of the neighborhood's private, unprotected open space is contained within the St. John's Seminary land purchased by Boston College. Today officially marks the end of the Brighton-Allston Bicentennial. The coolest thing about all these, is that #1 continues on past the 200th year (the museum even has its own blog), and #6 (Air Force Band concert) and 7 (Allston Village Street Fair) were so successful that they may also continue this year -- or at least some people made that suggestion. The Allston-Brighton TAB has a short video with images and narration about the history of Brighton for those who want the multimedia experience. The entire community should thank the organizing committee for the bicentennial and all of its subcommittees. And especially, we should thank the co-chairs of the bicentennial committee: Theresa Hynes and Tim Schofield. Schofield got a lousy-paying position in the process -- instead of getting a better-paid one -- and Hynes got a nice little park during the past year. I think she got the better deal. There is one piece of unfinished business: acquisition of a new piece of open space for the community. Stay tuned. Oh, and I almost forgot: the last day of the 200th year was supposed to have a flea sale at the site of the Brighton-Allston Heritage Museum. It snowed a lot the day before, so they postponed the fire sale flea sale until Saturday, March 8th. I hope they didn't sell off any of those old artifacts, especially not the diorama, based on the 1875 map of Brighton -- the earliest known surveyor's map of the town -- that's got my 1865 house on it. As most people know, the Roman Catholic Church's celebration of St. Patrick occurs annually on March 17. Irish bishops decided in 2007 to move the feast day of St. Patrick in 2008 to be earlier, on Saturday, March 15, to avoid the conflict. They didn't want to postpone St. Patrick's Day to April 1st, because it would create a scheduling mess with the civil celebrations. Seán Cardinal O'Malley, Archbishop of Boston, notes, however, that Saturday, March 15 now conflicts with the official church calendar schedule for celebration of St. Joseph. (Did the Irish bishops realize this conflict?) Cardinal O'Malley doesn't want to bump the feast of St. Patrick a day earlier because March 14 is a Friday during Lent -- which is a traditional day of fasting (although now it is observed by not eating meat). So Cardinal O'Malley has chosen instead to strike out a different path within the Archdiocese of Boston by celebrating the liturgical Mass for St. Patrick on March 17th, i.e., on St. Patrick's Day itself. That day also happens to fall on Evacuation Day, a civil holiday here. There we have it: this year, St. Patrick's Day will be celebrated as a religious day on St. Patrick's Day -- here in the Archdiocese of Boston, but not in Ireland or in many other dioceses that follow the Irish bishops' lead. This marks the first time the date has been changed since 1940. The next conflict with Holy Week is not expected until 2160. The construction mess over at St. Elizabeth's Medical Center has caused their annual Easter Egg Hunt to be moved over to the (former) St. John's Seminary land for the second straight year. But this year, it will occur a week early -- on Saturday, March 15th, the date of the entire church's St. Joseph's Day as well as the Irish bishops' St. Patrick's Day. Next week: How I Learned to Stop Worrying and Start Leaping by Loving the Gregorian Calendar. Lowe's proposes to build a Home Center at 40 Guest Street at Brighton Landing which will consist of 180,000 square feet on two stories. Parking will be provided for 403 cars. The Boston Redevelopment Authority is conducting a Large Project Review of the proposal under the Article 80 process. Copies of neither the PNF nor the traffic studies are available online. The initial public meeting on the Project Notification Form generated community concerns on the traffic impacts, which the BRA instructed Lowe's to study. This meeting will be present the traffic study for the proposed development project. Not surprisingly, though, is that most are in Dorchester. The city recently had a media event cleanup of properties along one particularly blighted street, Hendry Street, in Dorchester that was the subject of an earlier Boston Herald article (archive fee). Chris Lovett at Neighborhood Network News has the back story on that street. The distribution on that map is striking. You have whole neighborhoods without any foreclosures at all -- Allston-Brighton, Jamaica Plain, Mission Hill, Fenway, South End, Back Bay. Then you have some neighborhoods with a few scattered dots -- Roxbury, Southie, Eastie, Hyde Park, Roslindale, Mattapan. And then there's Dorchester. Wow. There has been an increase of property being taken from unattended motor vehicles in the Allston-Brighton sections of Boston, most notably GPS [Global Positioning Satellite] systems. Please safeguard your property such as this by removing them from your unattended motor vehicle, and removing the suction cup holder from the windshield. Most new GPS systems have a lock access option, making it useless to anyone else, other than the owner. Please use this lock option if available. Don’t become an unnecessary victim. Please report any suspicious activity to the Boston Police by dialing 911. The event tonight at Oak Square for the PBS show "Between the Lions" has been cancelled due to inclement weather. The Presentation School Foundation plans to reschedule the event. * All City of Boston afternoon and evening activities will be cancelled. Everyone is encouraged to use public transportation. * Do not park cars within 20 feet of an intersection. Parking too close to an intersection can restrict emergency vehicle access. * Do not throw snow back into the street. "Throwbacks" force the city to remove snow from the same street twice. * Shovel out fire hydrants close to your home. * Property owners are reminded to shovel snow from sidewalks that abut homes and businesses. * Do not double park. * Keep wheelchair ramps clear. * Check on elderly and neighbors and others in need. During declared snow emergencies, discounted parking is available at several parking lots and garages to cars that display Boston resident parking stickers. A list of locations is available at www.cityofboston.gov/snow. The city's Know Snow program will be in effect this afternoon to alert residents of the snow emergency. Dunn said neighbors' complaints about the location of student housing, in light of longstanding demands to house more students on campus, amounted to "a question of NIMBYism." NIMBY is the acronym for "not in my backyard." "Everyone wants to see college students live on campus, unless they happen to live close to campus," Dunn said. Mayor Thomas M. Menino said yesterday that BC should limit new dormitories to the traditional campus. "I say to them, why can't they build the new dorms on the campus they already have?" he said. "We want to see more housing on the present campus." Mayor Menino is a resident of Hyde Park. For Dunn to call opposition to the dorm proposals "NIMBYism" would require Brighton to be located in the backyard of Hyde Park, a geographically-challenged proposition. It is not often in city politics that the spokesman for a large developer accuses the Mayor of NIMBYism; in fact, I can't recall a single time. Given the Mayor's effective power over agencies such as the BRA, which has the statutory authority to approve or reject any proposed development on BC's land, it would also seem unwise. I can't imagine the look on the Mayor's face when he opened the newspaper this morning and read Dunn's remark. Suffolk University proposed in 2006 to build a 22-31 story dormitory on Beacon Hill, but Mayor Menino killed that proposal when he changed course in December 2006 to oppose the project. Bowing to the city's opposition to its plans, Suffolk University is giving up on the idea of putting a new dormitory tower on a Beacon Hill site. Instead of expressing disappointment, Nucci said Suffolk was focused on moving forward. "Suffolk wants to peacefully coexist with our neighbors," Nucci said. Suffolk and the city quickly found common ground, and the city backed a new plan for a dormitory in the Downtown Crossing area within three months. Boston College spokesman Jack Dunn said the college would work to address the city's concerns. But he said the Chestnut Hill campus is already "exceedingly dense" and cannot handle 500 additional undergraduates. Building dorms on the Brighton property, he said, is the only way the college can add student housing. While BC spokesman Dunn provided similar sentiment that BC would work with the city, by telling the Globe that the main campus cannot accomodate additional dormitories he already appears to be rejecting any such compromise with the city and the neighborhood. Suffolk VP Nucci expressed no such rejection of alternative dormitory locations -- nor did he insist that Suffolk's original proposal was the only possible solution -- after the city killed Suffolk's dorm proposal, in contrast with BC spokesman Dunn's comments. Suffolk VP Nucci expressed the sentiment that "Suffolk wants to peacefully coexist with our neighbors"; in contrast, BC spokesman Dunn made no such gesture, instead attacking the neighbors (and the Mayor) by accusing them of "NIMBYism." Let's hope BC can try to follow Suffolk's lead by actually working with the city to come up with better locations for their dormitories, rather than insisting that there is no other possible way to house more students. And let's also hope that BC's officials can also follow Suffolk's lead by showing more politeness towards the community and the Mayor. UPDATE: Harry Mattison has a few comments on this over at the Allston Brighton Community Blog. UPDATE: Dunn appears to have been gentler in comments to the Boston Herald. The Boston Redevelopment Authority today called for Boston College to house more of their undergraduate students on their traditional campuses in Boston and Newton, but not on the formerly St. John's Seminary land purchased since 2004 from the Archdiocese of Boston. The BRA also directed BC to explore other siting, size, and configuration options for its proposed 1500-seat baseball stadium, which had been proposed for a location close to neighborhood houses in Brighton. The BRA's direction came in a document called a Scoping Determination, which was issued by the city in response to BC's December 5, 2007 filing of BC's proposed Institutional Master Plan Notification Form. BC's master plan had proposed to add 610 beds of undergraduate housing to their campus, but to do so by putting 500 new beds onto their new "Brighton Campus" -- the former seminary land. BC acquired the 65 acres of land from the Archdiocese in a series of purchases between 2004 and 2007. Many letters from local elected officials, civic leaders, members of the public, and the BRA's BC Task Force, that were submitted during a public comment period which ended February 5, 2008, expressed opposition to BC's proposal for undergraduate dormitories on the Brighton Campus. Mayor Thomas Menino expressed his opposition to the Brighton Dorms earlier this year, which was probably the final indication that BC's dorm proposal was doomed. Given widely stated concerns about the placement of undergraduate housing on the Brighton Campus, BC shall study and present alternative housing proposals, including proposals to restrict undergraduate housing to the existing campus areas in Boston and Newton while still increasing the number of undergraduates housed in BC-controlled housing. "Increased housing density on the areas currently proposed for undergraduate housing on the existing campus areas (e.g. the “Mods” site). Full build-out of the “Mods” site with new, denser housing during the course of the 10-year IMP. Retention of housing on the Edmonds Hall site (in the existing structure or a replacement), with alternative siting of the proposed Recreation Center. Alternatives on the Shea Field site, including non-residential uses, decreased housing density, and setbacks or buffer zones." The BRA called upon BC to look into revised size and configuration of their proposed baseball stadium, as well as to look at alternate sites. BC proposed a 1500-seat baseball stadium for the Brighton Campus at a location that appears to be within 100 feet of neighborhood houses on Lane Park and Anselm Terrace. Present alternative sizes and seating configurations for the baseball facility at the proposed location, as well as a discussion of potential alternative locations for this facility, including the Shea Field site. The BRA also called for study of the environmental and health impacts of proposed artificial turf fields. BC proposed three such fields on the Brighton Campus in a location that currently contains grass playing fields and has underlying zoning of "Conservation Protection Subdistrict" under Article 51 of the zoning code. The SD did not give clear instruction as to whether or not the proposed athletics fields should have lighting for nighttime use. Instead, the BRA asked for the "rationale" for the proposed lighting for each facility (i.e., the four athletics fields), "assess the impacts of lighting and noise," and mitigation measures, "including agreements regarding hours of use," for minimizing the impacts. The transportation system should be designed to minimize the use of private automobiles and maximize the transportation alternatives for both Boston College affiliates and neighborhood residents. Improved shuttle service, enhanced public transportation, bicycle infrastructure, car-sharing, and other elements should all be considered. This goal should be supported by aggressive transportation demand management programs. The BRA did not, however, call upon BC to fund an independent peer review of their transportation, traffic, and parking plans in their master plan. This peer review had been called for by many elected officials, transportation experts -- notably Fred Salvucci, former state Secretary of Transportation, and Frank Trantomozzi, Chief Engineer of the Massachusetts Highway Administration -- and members of the public. Harvard University has already agreed to fund such independent peer review as part of their new science complex's review with the state's Environmental Protection Act office. Many of the public comment letters submitted to the BRA called upon BC to provide conservation easements to protect buffer zones of their campus in perpetuity as open space. Buffer Zones and Preservation Areas. Identify possible areas where land could be used as “buffer zones” for the community, such as the outer edges of the Brighton Campus along Lake Street and between the proposed dorms on Shea Field and the Reservoir, and/or areas that could be preserved in an undeveloped state in order to mitigate the impact of new development on the existing character of the Brighton Campus. The master plan was submitted by BC as part of a re-zoning process under Article 80 of the zoning code. The BRA's SD clarifies how some parts of the zoning code will be considered as part of this re-zoning process. The BRA is explicity that the Greenbelt Protection Overlay District (Article 29) for the areas along Commonwealth Avenue "must be taken into account" as part of this Article 80 master plan process. BC’s proposed development should preserve key elements of the character of the former Archdiocese land consistent with the goals of the underlying Conservation Protection Subdistrict (“CPS”) zoning, including preserving key areas of green space on the Brighton Campus. The BRA's Scoping Determination can be found here (PDF format). If that link has problems, those with access to the BC_Neighbors_Forum google group can find another link here. The Boston Globe has already come out with a quick article, available at boston.com. UPDATE: The Boston Globe's full article can be found here. And here is a comparison between Suffolk University and Boston College's responses to BRA opposition to their dorm proposals. UPDATE: The Boston Herald has an article on it. It's one of the last opportunities to see Bob Van Meter quoted in his current employment position at the Allston Brighton Community Development Corporation. The Boston City Council is considering an ordinance that would petition the Boston Zoning Commission and the Board of the Boston Redevelopment Authority to ban more than four off-campus students from living together in a single apartment. The proposed ordinance will be presented and discussed at Wednesday night's meeting of the Allston Civic Association. A recent court case and subsequent consent decree defined what kind of living arrangements constitute an illegal boarding-house, which, in effect, loosened up the restrictions. As long as unrelated residents of an apartment shared common space, such as kitchen and bathrooms, do not have locks on individual bedroom doors, and don't individually rent from the owner, then the occupants are considered a "family" unit that can legally rent an apartment together. Off-campus student housing in Allston-Brighton often lawfully exceeds four students per apartment. "Club Kirkwood" is one notable example. Since  the current definition of family remains unresolved, causing an ambiguity in the law and its enforcement. As a result, unscrupulous landlords have taken advantage of this limbo by packing upwards of ten students into college apartments that once housed families. These actions have subsequently raised rents to a level where virtually no one can afford to live within certain neighborhoods of the city. The proposed change to the zoning code will require that landlords cap the number of students living within one dwelling to four, thereby restoring a semblance of control to what has become an escalating crisis. BC's student newspaper, The Heights, ran a news story on the issue and also an editorial opposing the proposed ordinance. The editorial says that the proposed ordinance treats students "unfairly" and is "counter-productive to the constituency it seeks to placate" -- i.e., "neighbor's concerns about loud parties and poorly-kept residences." As Bill Mills noted at the October 16th meeting of the BC Task Force, they allegedly found smoke detectors had been removed from the ceilings, missing CO detectors, underage drinking, and so on. A sting operation was planned for inspectors from the city's Inspectional Services Department, which identified other problems -- such as residents illegally housed in the basement, others housed in parts of the attic that don't meet height requirements, and locks on the bedroom doors (that might have constituted an illegal boarding house). The effect [of the ordinance on student-occupied off-campus housing] is not wholly seen in the Brighton area that surrounds BC, mainly because most of the houses are owned by the people living in them. The owner-occupied housing rate was only 19.3% in Allston-Brighton in the 2000 U. S. Census; in Brighton alone, the rate was 23.6%. Of owner-occupied housing in Allston-Brighton, only 26% of the units had more than 0.5 persons per room, while 49% of renter-occupied housing units did. The conclusion from the census data: most of Allston-Brighton's housing stock is renter-occupied, and the rental units are, on average, more packed with occupants than the owner-occupied units. It is hard to know where The Heights gathered its facts since so many of the story's statements, such as the one above, have no attribution. Small Property Owners of America opposes the proposed ordinance, providing a series of arguments against it: displacement and high rents; de facto rent control and devaluation; housing shortage and higher rents; and college and university concerns. Councilors Michael Ross and Mark Ciommo will be appearing at a meeting Wednesday night of the Allston Civic Association in order to discuss the proposed ordinance. Councilor Ross submitted the original petition in December 2007. His office is spearheading the effort to pass the ordinance. In a community-wide letter sent out recently by staff member Johanna Sena, she anticipates that "this issue will be coming before the BRA Board for their approval at the end of February and before the Zoning Commission in early March." 'Family' one person or two or more persons related by blood, marriage, adoption or other analogous family union occupying a dwelling unit and living as a single, nonprofit housekeeping unit, provided that a group of five (5) or more students enrolled at or attending a post-secondary educational institution shall not be deemed to constitute a family. A group residence, limited... shall be deemed a family. Other items on the agenda are listing at Harry Mattison's blog. How will the city prevent the landlords from obtaining zoning variances in order to chop up the housing into smaller and smaller units to keep each unit's occupancy below five? What is that anticipated increase in expense for off-campus housing for various neighborhoods of the city, e.g., Brighton, where occupancy would suddenly switch from, say, ten tenants to four? What are the universities' plans for dealing with the added increase in off-campus housing that will result? In particular, what would Boston College possibly do to provide on-campus housing for its students with greatest financial need who might not be able to deal with the rental increase? If half the Radnor/Kirkwood/Upper Foster area off-campus students, for example, were suddenly required to find alternative housing, where do real estate professionals believe that they would be most likely to move in the current housing market? What fraction of the impacted rental units are suitable for family housing, and what fraction are excessively-sized such that they are beyond the needs and/or means of most families? UPDATE: UniversalHub has a series of comments posted about this topic. The TAB has published online a nice piece about how John Connolly, the new Boston City Councilor-At-Large from West Roxbury, is settling into his new job. He eventually managed to find his office and figure out who to call about downed power lines. He doesn't like the building itself, though he doesn't mention his position on whether or not it should be moved to the waterfront -- or instead get a twirling-thingy up on top. And most of the phone calls to the office are about constituent services, fully consistent with those who say it makes up 75% of a city councilor's job. In his first month on the job he made it out to Brighton to attend one of the meetings of the BC Task Force, and followed that up with a letter to the BRA that was well-informed on the issues. It might lead you to think that he had spent a decade in office already. And maybe, just maybe, it might also lead you to believe that he is trying really hard to learn about neighborhood issues in preparation for a possible mayoral bid. Just maybe. We'll watch those fund-raising numbers carefully over the next six months to see how well he replenishes his warchest. Note: This event has been CANCELLED due to inclement weather. In a previous post, I summarized key points raised in the letter written by members of the BC Task Force to the Boston Redevelopment Authority as part of the public comment period following Boston College's filing of their Institutional Master Plan Notification Form on December 5, 2007. The Boston Globe's City Weekly ran an article on the letter in today's edition ("Task Force Seeking Limits on BC Project") and the Allston-Brighton TAB also ran a news story about it in Friday's edition ("Community Task Force Urges Significant Changes to BC Plans"). Top MBTA officials acknowledge that for years the agency has been secretly cutting thousands of bus and train trips from published schedules to lower costs - a practice that has left legions of customers waiting for rides that arrived late or not at all. T General Manager Daniel Grabauskas told the Herald he has moved swiftly to end what he called “hidden service cuts” on bus and subway lines throughout the system. But he said customers have been lied to for years so the T could claim to operate at a level of service it was not delivering. “I had one very (senior-level) person say to me, ‘We knew we were dropping bus trips, so we’d go to the communities where we were dropping trips out of garages - and we would lie to people,’ ” Grabauskas said. Grabauskas appears to be channeling the Straight-Talk Express now that John McCain has thrown himself under the bus. For everyone who stands at a bus stop in foul weather waiting for a scheduled bus that never seemed to show up, you may now know the reason. For those who called the MBTA customer service number to try and figure out where the bus was -- or if a bus was actually running the scheduled route -- and got the run-around from the customer service agent or the garage's dispatcher, you may now know the reason. For those who may not remember, MBTA General Manager Grabauskas doesn't ride the T himself because "it tends not to be convenient to me." Via UniversalHub, which includes links to other bloggers' amazement and outrage at the MBTA General Manager's admission. Part of Commonwealth Avenue due east of Allston will soon be getting bike lanes, according to an announcement Thursday by the City of Boston. The proposed bike lanes were part of Mayor Thomas Menino's State of the City speech on January 15, 2008. The new lanes should be painted by summertime. The city’s Boston Bikes department announced Thursday that the strip of Commonwealth Avenue between Kenmore Square and the BU Bridge will have 5-foot-wide bike lanes available in each direction by this summer. The bike lanes will reallocate space on the street and sidewalks as part of a planned reconstruction of Commonwealth through the Boston University campus. That could mean eventually extending the bike lanes past the BU Bridge and into Allston, a college neighborhood full of cyclists and the scene of a bike fatality last spring when 23-year-old Kelly Wallace was struck by a motorist. But he expressed concern that the planned bike lane will sandwich riders between traffic and parked cars. “It often winds up even more dangerous due to the chance of getting (struck by a car door), and motorists swerving across cyclists to snag a just-noticed parking spot,” Braiotta said. The Boston Globe reported in Thursday's edition that GateHouse Media, the owner of more than 100 daily and weekly newspapers in the greater Boston area, will be cutting around 60 staff positions. Thirty-five of the positions are anticipated to be layoffs, while another 25 will consist of currently-vacant positions that will not be re-filled. The cuts correspond to nearly 5% of the entire staffing of GateHouse New England's papers. GateHouse Media is the owner of the Allston-Brighton TAB, a weekly community newspaper, which will be impacted by the staff reductions. The larger newspapers owned by GateHouse Media in the Boston area are the Patriot Ledger and The Enterprise of Brockton. The A-B TAB's position of staff reporter is currently vacant after the departure of Rich Cherecwich last month to California. His duties are currently taken up by a number of free-lance reporters. A source at GateHouse Media confirms that the reporter position at the A-B TAB is one of the 25 vacant positions that will not be filled as part of the staffing cuts. The A-B TAB has typically had 1.5 FTEs on its staff -- one full-time reporter plus an editor, Valentina Zic, who is in charge of two newspapers -- which will be reduced by two-thirds. Free-lance reporters will be replacing the full-time staff reporter position. The staff reduction at the A-B TAB comes at a critical time for the community because of the challenge in covering the massive institutional expansion proposals of Harvard University in North Allston and Boston College in Brighton. Free-lance reporters will have a steep learning curve in getting "up-to-speed" with the complicated projects proposed by the institutions, and the year(s)-long process of regulatory approval an discussion between the community and the institution. One way the A-B TAB appears to be dealing with this challenge is to have the same free-lancer cover a given issue regularly. In the last month, Susan Haverson, for example, has had several bylines covering the BC expansion issue. The Boston Globe has also been using the same approach in its City Weekly coverage, where free-lancer Andreae Downs is covering the Harvard and BC beats in A-B for the Sunday section. This is a tough cut indeed — one of the benefits of a local paper's having a Statehouse reporter is that he or she can cover hometown legislators, assess the local impact of various initiatives and the like. The A-B TAB regularly includes "roll call" summaries of how local elected officials voted on various bills in front of the State Legislature. Such coverage will be more difficult -- possibly even stop altogether -- without a State House Bureau staffer in the GateHouse Media consortium. EDIT (2/17/08): Dan Kennedy reports at Media Nation that, while State House Bureau reporter Tom Benner is being laid off, he will be replaced. The Patriot Ledger of Quincy is therefore not closing their State House Bureau, after all. Adam Reilly recounts how he tried to fact-check his original report, which now appears to have been wrong. Allston-Brighton and Boston city-wide elected officials submitted public comments last week in response to the December 5, 2007 filing by Boston College of its Institutional Master Plan Notification Form. Letters were sent to the Boston Redevelopment Authority by Allston-Brighton District 9 City Councilor Mark Ciommo, Boston City Councilors-At-Large John Connolly, Michael Flaherty, Steve Murphy, and Sam Yoon, State Representatives Kevin Honan and Michael Moran, and State Senator Steve Tolman. Councilor Ciommo and Representatives Honan and Moran wrote a joint letter. The BC Task Force also submitted an extensive, 12-page letter. The task force usually meets monthly, but met weekly during January in order to gather additional community input prior to writing their letter. Their letter is phrased in terms of summarizing the issues on which there is broad community consensus; they then made recommendations which directly follow from the consensus they identified. As described below, one letter -- from Senator Steve Tolman -- appears to differ substantially from the others. Including a permanent conservation easement on part of the Brighton Campus buffer zones to protect against future development (BCTF, Ciommo/Honan/Moran, Connolly). The hot-button issue in BC's IMP is undergraduate housing. Should BC move all their undergraduate students on-campus (#2)? All of the elected officials except Senator Tolman (and Councilor-At-Large Yoon) agree that BC should provide housing for 100% of their undergraduates on campus; Senator Tolman's letter was silent on this issue, neither supporting nor opposing it. How tall should the dormitories be? Councilors Ciommo and Connolly, and Representatives Honan and Moran, all indicate that BC should accomplish the on-campus housing goal by building dormitories taller than four stories on their main Chestnut Hill Campus (#4); Senator Tolman's letter is silent on this issue. How about the siting of the Brighton Athletics Fields? Councilors Ciommo, Connolly, and Murphy, and Representatives Honan and Moran, all requested, at a minimum, studies of alternate siting for the highest-impact athletics use, i.e., the baseball stadium (#7). Senator Tolman's letter only said that "the effects of new athletic fields [on surrounding neighborhoods] must also be minimized." Should open space on the Brighton Campus be preserved in perpetuity through a conservation easement? Councilors Ciommo and Connolly, and Representatives Honan and Moran, say yes in their letters (#22); Senator Tolman is silent on the issue in his letter, writing instead that "to the greatest extent possible this open space [on the Brighton Campus] should be maintained and accessible to the neighborhood." I am well aware of the opinions expressed by my colleagues in their letter and I am supportive of the principles contained therein. However, further review is necessary for resolution of appropriate uses of the Brighton Campus. It appears as though Senator Tolman wants to leave open, at least for the time being, all of the proposed uses for the Brighton Campus -- which would include dormitories, a baseball stadium, etc. The Boston Mayor's Office of Neighborhood Services has initiated a program to hold regular office hours in the districts, including both Allston and Brighton, in order to provide better constituent services for both residents and business owners. Brighton: 1st and 3rd Wednesdays each month, 2:00 - 6:00 pm, Brighton Branch Library, 40 Academy Hill Road, Brighton. Allston: 2nd and 4th Wednesdays each month, 3:00 - 7:00 pm, Honan Allston Library, 300 North Harvard Street, Allston. Our goal is to enhance the delivery of city services and facilitate communication with our constituents by providing you with easy access to a member of the Mayor's staff. For more information, contact Holloway at 617-635-3485 or paul.holloway@cityofboston.gov . The New England Regional Council of Carpenters has just closed on a $5.8 million purchase of property in Dorchester at 750 Dorchester Avenue, which includes 42,000 square feet of office space, according to GlobeSt.com. The Council of Carpenters currently has its headquarters at rented office space on Summer Street in South Boston, and also owns a training center at 371-385 Market Street in Brighton Center. They would move both the headquarters and the training facility to the newly-purchased Dorchester site, according to GlobeSt.com. The association hopes to expand the [new] property’s footprint, and is in the process of identifying an architect to develop a design. “It’s going to take awhile,” he says of opening the new facility, pledging to first meet with city officials and community members to hammer out the details. The Brighton Center site is located next door to the Rite Aid Pharmacy which had its roof collapse in December. 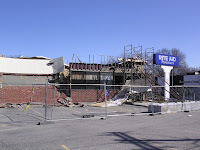 The Rite Aid has been closed ever since, with structural-support scaffolding installed to hold up the walls against further collapse. The training center property is currently assessed at a value of approximately $2 million. A Watertown reader wrote a letter-to-the-editor of the Boston Globe in response to the MBTA's financial woes recently covered by the Globe (a month after BostonNOW beat them to the punch by quoting the General Manager, Daniel Grabauskas, as saying the T is "structurally broke"). When I have to wait in the cold for 40 to 50 minutes, day after day, while bus after bus on the 57 line passes by packed with riders just a few stops after its start in Kenmore, it's obvious to me that the T can't coordinate its basic function as a public transportation provider, let alone extract itself from this financial morass. The presidential primary election was held on Tuesday, February 5, 2008. Here are the Allston-Brighton results by precinct for the nomination for president for the Democratic Party. Provided by Chris Lovett (of BNN) via Adam Gaffin (of UniversalHub). EDIT (2/8/08): The Allston-Brighton TAB has complete listings not only for Democrats (as above) but also for Republicans. 31.9% of A-B registered voters cast a ballot. For those who haven't done so yet, you have until 8 pm to vote in today's presidential primary election. Based on the number of voters at my precinct, I predict that Allston-Brighton voters will be turning out at around 25% of registered voters today. That is far better than the measly 13% who turned out for the municipal election in November.